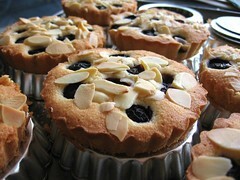 Fruit Financiers - Do You Know The Muffin Man? Notes: A notable difference in this financier recipe (I used blueberries) is the use of softened, rather than melted, butter. Like a stiff cake or soft cookie. Nice buttery flavour, but not nutty enough, maybe toast the ground almonds first next time.